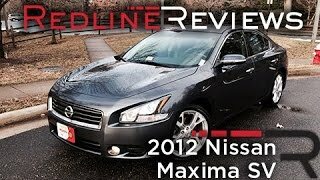 Nissan Maxima 2012 is now available at the Nissan dealerships nationwide. 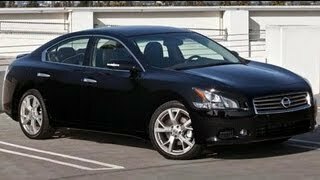 For the MY2012, Maxima is offered in two models - Maxima 3.5 S and Maxima 3.5 SV, each featuring a standard 290-horsepower 3.5-liter V6 engine and Xtronic CVT® transmission – and with no price increase despite a number of significant enhancements for the new model year. The MSRP for Maxima 3.5 S is $31,750 USD and for Maxima 3.5 SV CVT is $34,450 USD. 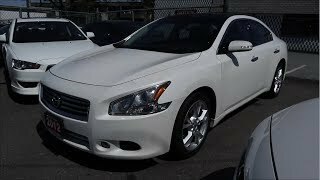 Nissan North America, Inc. (NNA) today announced U.S. pricing for the 2012 Nissan Maxima, which is on sale now at Nissan dealers nationwide. Maxima is again offered in two well-equipped models – Maxima 3.5 S and Maxima 3.5 SV, each featuring a standard 290-horsepower 3.5-liter V6 engine and Xtronic CVT® transmission – and with no price increase despite a number of significant enhancements for the new model year. For 2012, Maxima receives a refreshed exterior – with a new front grille design, new rear combination lights, and new 18-inch and 19-inch aluminum-alloy wheels. Inside, the roomy Maxima interior’s enhancements include a new meter cluster illumination color (white), new Dark Piano-hairline trim, a new Atlantic Cherry wood tone trim, a new metallic-finish trim, and a new Cafe Latte interior color. There’s also a new audio segment display and new audio/HVAC knob design. In addition, two new exterior colors are offered: Java Metallic and Dark Slate. The other big news for the 2012 Maxima is the addition of a special Limited Edition Package for the 3.5 S model, which features smoked appearance headlights, High Intensity Discharge (HID) Xenon headlights, a compass in the rearview mirror, 18-inch aluminum-alloy Dark Hyper Silver finish wheels, a rear spoiler, dark satin chrome front grille, fog lights, outside mirrors with integrated turn signals and metallic trim. The Limited Edition Package provides excellent value at an MSRP of $710 USD. 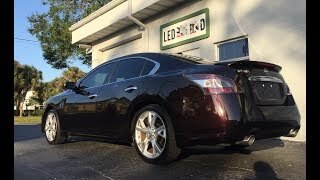 The flagship Nissan Maxima continues to set the bar for Nissan sedans, combining breakthrough sports sedan styling, a driver-oriented cockpit, ample comfort and luxury for passengers and an advanced drivetrain anchored by Nissan’s legendary VQ-series V6 engine. Along with its refreshed exterior – with a new front grille design, new rear combination lights, and new 18-inch and 19-inch aluminum-alloy wheels – enhancements for 2012 include a new meter cluster illumination color, new available trim selections, a new Cafe Latte interior color, and two new exterior colors. A special Limited Edition Package with unique equipment is also added to the range of available packages that includes a Premium Package, Sport Package and Tech Package. 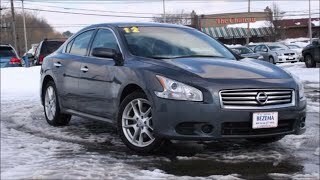 The 2012 Maxima is offered in two well-equipped models – Maxima 3.5 S and Maxima 3.5 SV, each featuring a standard 290-horsepower 3.5-liter DOHC 24-valve VQ-series V6 engine and Xtronic CVT® with manual and “Ds” (drive sport) modes and available paddle shifters. Maxima’s sporty interior design combines a driver-oriented cockpit with ample comfort and luxury for passengers. The wide range of available technology includes a premium Bose® audio system, RearView Monitor and Nissan Hard Drive Navigation system with XM NavTraffic Real-Time Traffic Information and XM NavWeather™ (XM subscription required, sold separately). In North America, Nissan's operations include automotive styling, design, engineering, consumer and corporate financing, sales and marketing, distribution and manufacturing. Nissan is dedicated to improving the environment under the Nissan Green Program 2010 and has been recognized as a 2010 and 2011 ENERGY STAR® Partner of the Year by the U.S Environmental Protection Agency. More information about Nissan in North America and the complete line of Nissan and Infiniti vehicles can be found online atwww.NissanUSA.comandwww.Infiniti.com.